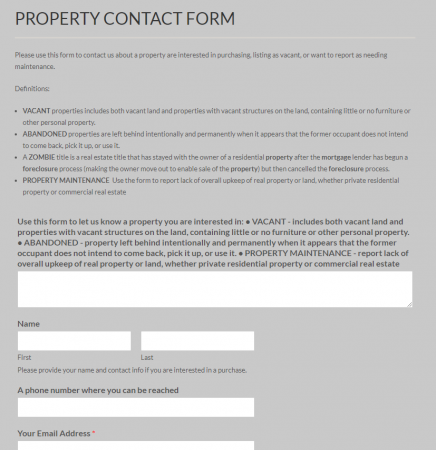 VACANT properties includes both vacant land and properties with vacant structures on the land, containing little or no furniture or other personal property. ABANDONED properties are left behind intentionally and permanently when it appears that the former occupant does not intend to come back, pick it up, or use it. A ZOMBIE title is a real estate title that has stayed with the owner of a residential property after the mortgage lender has begun a foreclosure process (making the owner move out to enable sale of the property) but then cancelled the foreclosure process. Please provide your name and contact info if you are interested in a purchase.